"You look like a Christmas cookie"
Eating out was a success. We ended up venturing to Texas Roadhouse and I ordered a nice 6 ounce filet but requested that it not be seasoned or marinated. My side items were a plain baked potato with baked beans. My levels of self control were definitely tested, but I was so proud of my own willpower. Thank the good Lord that I have a strong support system like my best friend Ashley because she wouldn’t even let us bring the bread to the table. And since she is a vegetarian, she also had to be picky when ordering her food, hence her order of a sirloin kabob minus the sirloin. She also took the adventure to Townsend with me to go “hiking”, but the road was closed, so we ended up doing a brisk walk on the bike trail. 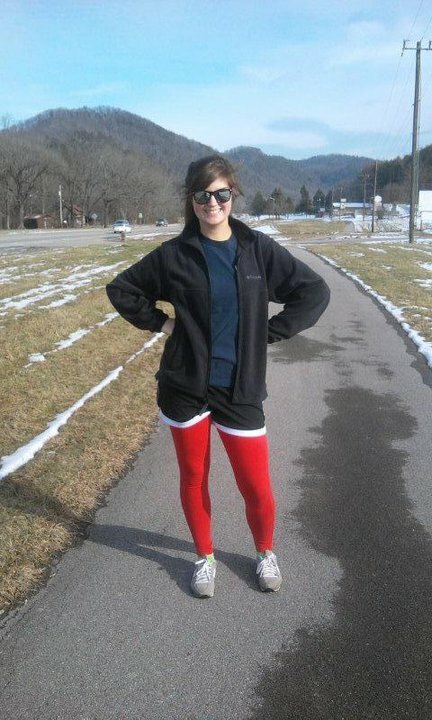 Based upon her red leggings and green socks, I informed her that she looked like a Christmas cookie. The photo below is Ashley with her precious outfit. She was definitely styling. Today was also a super exciting day. I woke up early to get to the gym to kickbox, only to find out that I had mixed my days up and there was no class. Sad day. I ended up going to the dietician’s office to weigh myself and as of today I have lost a grand total of 25 pounds. Yay me! After that, I drove over to Runner’s Market to see what sales were going on and to buy some Clif bars. At 11, I had another training session with Chip. We hit the ground rolling and it was a great workout! I even met a famous person today; Anthony Toribio, who is a defensive lineman for the Kansas City Chiefs was working out today and spoke to Chip during our session. Too cool! It was also discovered today that I am gaining some nice muscle in my arms and legs. I was reading Julie Morris’ blog today about how great it is to find a support system who will be a constant motivation and backbone in your life and I am so blessed to have Ashley to support me emotionally and Chip to push me physically. Definitely would be 25 pounds heavier without them in my life. So find someone who will take your fitness goals seriously and someone who will encourage you to give your best even when you can’t see the light at the end of the tunnel. It is totally worth it, because YOU are totally worth it. Way to go with a successful eating out experience! And I totally agree on how important it is to have a great support system in weight loss/fitness! I am glad you have such a great system! Congrats on your 25 lbs loss! Thank you so much! I've been loving your encouraging comments. I really couldn't do it without so much support that God has blessed me with. Keep up your good work.